We love this tour. Our tour guide Linh is very good in explaining things to us. He is always ready to help and answer questions. Our tip is for you to avail the RT cable car ride so you will be able to explore the area more without getting tired. But if you would like to take the challenge of walking up, then I'd say it will be also be worthy. Going down could be a little steep according to our co-tourists who did the walking up. It was actually raining that time. 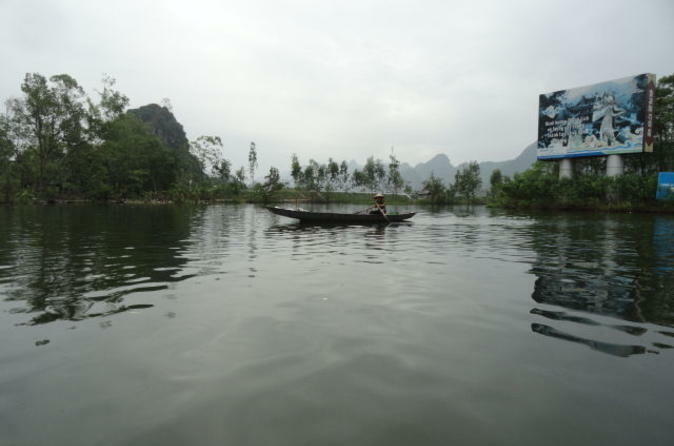 This day tour was the highlight of my 10 days in Vietnam. The full day Perfume Pagoda Small-Group Toir was amazing. 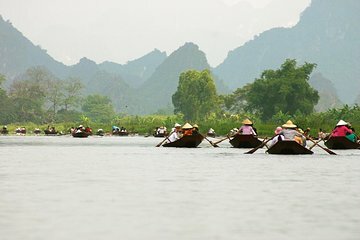 The boat ride propelled by women with oars, the hike up the mountain to the cave pagoda, the magnificent pagoda at the bottom of the mountin and lunch thrown in all make this tour well worth taking and an excellent value the only downside is a two and a half hour ride each way. Comfortable coach, but still 5 hours total on the road. However, I repeat well worth doing and a great value. I must explain the low review. The perfume pagoda, in and of itself, was an amazing experience. However, as other reviewers have noted, Viator does a poor job of explaining how physical this trip is. 2 1/2 hours in a bus, 1 hour in a very uncomfortable boat, and at least 2 hours of hiking to various areas total, plus a cable car ride. You'll survive, but this is a 'work' trip as opposed to a 'lazy' trip. Now for the small group tour I'd hate to see the large group!. There were no seats on the bus, that's how small our tour was. We were the last stop to be picked up at the Opera House, 30 minutes late, only to find that the only four seats were the very front plus a jump seat only one of which has the actual space of a real seat!. We should have stopped there, but we wanted this tour. When I complained to our guide, he stated that four people had joined the tour that morning .... which means they oversold our seats. 5 HOURS of sitting like that total, and we paid for that? Further, the lunch place was horrible. Even the locals on our trip ate very little and we live in Hanoi, so we are well versed in what food should taste like at a good tourist place. Never again ... we would absolutely never book through Viator again. Waiting for our money to be returned, and we'll let you know if that happens! Was great to get out of the city of Hanoi and see the rural scenery and agriculture and village life on this trip. Mountains were lovely and the rowing trip up the river was interesting although I wouldn't have wanted to do it in any weather warmer than the 30' we experienced!. But the trip had been described as having a cable car ride which would cut out a long steep trek and nothing prepared us for the hundreds of very steep steps we encountered to get to the two temples on the tour. We are nearer 70 than 60, and maybe not super-fit, but we are not decrepit and when warned about lots of steep stairs, we tend to choose another tour. There was no clear warning on this tour and yet the climb was very considerable. Even the younger tourists were gasping. We had to sit out of the tour group about 2/3 of the way up, as, even with cable car ride, we could not manage the remaining flights of steep stairs so we saw one temple and missed the other. Our guide Dong did all he could to assist us, but we had bitten off more than we could chew. I think a much more precise and accurate description of the tour is necessary and if you struggle with hundreds of steep stairs, don't choose this tour. Very interesting tour, lunch was great, could have been cushions on the seats on the boats we had a sore bum when we got off the boat. The tour was very good. The guide was very nice. Very nice places were shown. The afternoon lunch was v. good. We were picked up from the hotel in time. Worth the money.